The web is something we R.. E.. A.. D.. People forget this. And each culture *reads* in a different way. Arab folk read from the top of the page, across left and then right. Westerners read from the top of the page, to the right, then left, then right, down in a Z fashion. What does this piece of linguistic infromation mean for the readibility of your web site? Simple... you have to construct your web page in a certain manner so the majority of people can actually integrate the information into their brain. Do not make it hard for them. The brain gets confused and the finger goes click. This means that important information goes in 3 places. The important thing here is to be aware of these reading patterns. Different web sites will have different structures, but when the structures blatantly ignore these cultural reading patterns it just confuses the reader. It's A Brain Thing. Use some color to entertain the eye of the reader. But be careful, color is useful to focus the readers attention on some topic, but when it is used to excess it actually confuses the reader. The best way to know if you've used color appropriately is to ask 2 or 3 people to read the page and ask them what the information was about. If they can tell you (and mention key points where you've used color) then you've got the use of color right. deals with these principals of Readership, Access and Process exceptionally well. You must remember that your visitor has come to your web site because you promised them something! You made this promise in the your Ad... in the description of your site. You promised them a solution to a problem and now you have to deliver. You do this by making the information on your site, the central idea on your site accessible. The way to test your site's accessibility is to have a dozen people look at it and ask them to answer this question... "What Is It About? As them to answer this question in one sentence. If the answers they give you concur with what you indended with your site then your site is accessible. If not, then it isn't. You have some re-working to do. Process goes hand in glove with Access. Fundamentally this means "the steps required of the visitor to access the information they're seeking. Are these steps logical or confusing for them? Again your "What Is It About" exercise will clarify if you processes are on mark. A Unique Selling Proposition is "your promise." It's the problem that you solve for the visitor. AND, given that you only have 10 seconds to explain to your visitor what this problem is that your solve for them your USP has to be tight and very, very clear to them... immediately. Here are a few good examples of USP's working well. Dr Ralph Wilson's site Wilson Web is an excellent example of a highly targeted Unique Selling Proposition. The moment we land on this site we know exactly what it's about. also clearly indicates it's USP very quickly. This is clearly stated in the first two headings on the site. AND so does NetSite Design. It's another good example of a tightly defined USP. When we land on this site we get four clear messages. These are just three examples of many uses of a USP. "You Have To Deliver What It Is That You've Promised!" These are some of the crucial elements needed to create a selling web site. If you're interested in running a business on the web, then subscribe to The e*Analyst ezine where these topics are discussed in-depth. If you haven't worked this out yet, you soon will. There's a LOT of NONsense zapping around in cyber space about doing business on the web. 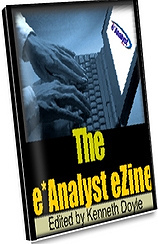 SUBSCRIBE to The e*Analyst ezine. ... and we'll give you a valuable Thank you gift just for subscribing to the ezine. -------->> T E S T I M O N I A L <<-------- As a graphic designer, and software developer I am very conscious of the subtle design elements of successful web sites. Very few ezine publishers understand both this subtlety, as well as the whole web marketing process. Your e*Analyst ezine is definately the exception here.